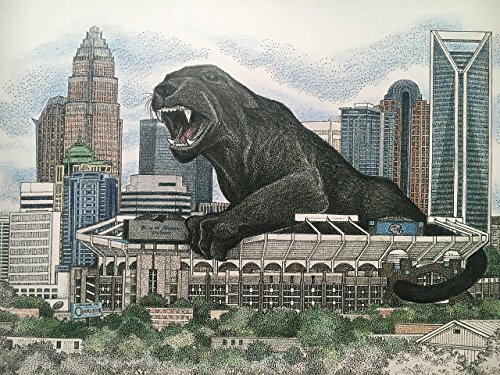 Limited Edition pen and ink print from hand-drawn original of Bank of the skyline of Charlotte, NC with a panther protecting his "turf"; the Bank of America stadium. The panther and the area of Charlotte skyline behind is hand-colored with colored pencils on each print, (so each original may vary slightly from the one shown). This is the third print in a "Panther Country" series I've been drawing since 1995. It is from a limited-edition series of only 500 prints and is signed and numbered. Your purchase includes print, foam-core backing, and about-the-artist flyer within an acid-free packaging. There is the option to purchase in black/white, or with partial color.